At 15:00 hrs on 21 March, the team was called out to a live-stranded dolphin in the neighbouring village of Crovie in Gamrie Bay, near Banff. Two local builders had discovered the animal thrashing around on the rocks adjacent to the pier and had called us for help. Despite being only 5 minutes away, sadly the animal gave up the struggle before anybody could get to it. The female Atlantic white-sided dolphin was pronounced dead on arrival. She was a beautiful dolphin, approximately 2 metres or so in length and in moderate to good body condition, although the trauma of the stranding had caused superficial injuries to her head and flippers. We won't be sure until the post mortem has been conducted, but we believe she may have been pregnant too. On the left hand side of the head, there were a number of possible bottlenose dolphin tooth rake marks, which may have been the precursor to her stranding. Bottlenose dolphins are reknowned for their aggression towards other cetacean species, and particularly for their attacks on the smaller harbour porpoise, so this is certainly a possible explanation for this incident. In 1997, bottlenoses drove a white-sided dolphin right up onto the beach at North Kessock, near Inverness. The animal was refloated, only to be driven up the other bank by the same bottlenoses. White-sided dolphins are pelagic (offshore) delphinids, and we have only had one confirmed sighting of the species in the inshore waters of the outer Moray Firth since 1997 when the CRRU first began its line transect surveys of the area (in fact this encounter with 12 animals was recorded just last August, 2005). In addition, as detailed in a recent CRRU paper by Baumgartner et al. 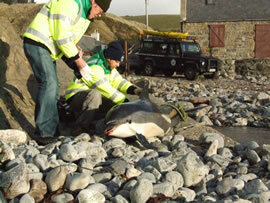 (2006), only 1 other white-sided dolphin stranding has been catalogued in along the southern coastline of the outer Moray Firth since 1992. Many thanks to all who assisted in this incident, especially local helpers Graham Cathcart & Darren Wiseman (MCA), SSPCA Inspector Scott Elphinstone and CRRU and BDMLR medics. For details on what to do if you find a stranded whale or dolphin, click HERE.